Professor Jack Chin delivered the Leary Lecture at the University of Utah S.J. Quinney College of Law today. Here is the web announcement from Utah. For 150 years, states have fought Congress for the power to control authorized and unauthorized migration. The immigrant stream continues to change the demographics of the nation, and immigration’s economic effects are debated in the midst of a tough job market. On March 31, Professor Jack Chin will deliver the 48th Annual Leary Lecture, “The Endless Battle for State Immigration Crimes,” at the University of Utah S.J. Quinney College of Law. The 12:15 lecture, to be held in the Sutherland Moot Courtroom, is free and open to the public. In the context of the current debate about immigration, a number of states and localities have become interested in using their own police, laws and courts to address what some consider an invasion, taking place in open disregard of the nation’s laws. “What could be wrong,” they ask, “with helping the federal government carry out its own laws?” This lecture will address the constitutionality of the recent wave of state and local laws dealing with immigration, the Supreme Court’s decisions on the matter, President Obama’s administrative amnesties, and the SAFE Act, pending in Congress, which would explicitly allow the states to enact their own immigration laws, so long as they were consistent with federal law. Gabriel "Jack" Chin teaches at the UC Davis School of Law where he specializes in criminal law, immigration and race and law. He is an award-winning scholar whose work has been published in the Cornell, UCLA and Penn law reviews, and the Yale, Duke and Georgetown law journals. His scholarship has been cited four times in the U.S. Supreme Court in cases dealing with prosecution of immigrants. The 48th Annual Leary Lecture is free and open to the public. One hour free CLE available. The event will be streamed live at ulaw.tv and archived for future viewing. The Leary Lecture is named in honor of William H. Leary, the College of Law’s dean from 1915 to 1950, who was renowned for his intellectual rigor and love of teaching. In early January, I wrote about Silicon Valley billionaire Tim Draper's proposed initiative ("Six Californias") that seeks to bring about a division of California into six separate states. As I explained, many large hurdles the plan faces are political-perhaps the biggest one being the requirement of federal legislation approving the creation of any new states. Specifically, because Mr. Draper's plan would for the foreseeable future likely hurt the Democratic Party's representation in the U.S. Senate and (even more so) in the electoral college, Democrats in Congress and the White House would be disinclined to approve the idea. But putting political constraints aside, I also mentioned in January some possible legal challenges to Mr. Draper's initiative. Now that the measure's adherents are in the process of gathering signatures to place the proposal before the voters, the time is ripe to begin addressing in more depth these potential legal problems. Today I analyze one key issue-whether the measure might be blocked by California courts on the ground that the proposal constitutes a "revision" of the California constitution. Can Californians Consent to a Break-Up Through a State Constitutional Amendment Initiative? Let us start with a brief summary of the Six Californias initiative proposal. (Readers who want more background or detail can consult my January column.) The initiative provides for California's consent to the creation of six separate states out of what currently makes up the Golden State. The initiative sets up the basic geographic contours of the six new states, but the proposed lines separating each of the six are provisional; under the measure, over the next few years, any county that adjoins any of the proposed states can choose to become part of that contiguous state, provided that the counties that are provisionally in that neighboring state also agree to add such a county. On January 1, 2018, the Governor of California is to certify to Congress that California has consented to the creation of six separate states that are defined along the lines described in the initiative-subject to any modification that has occurred because some counties have successfully attempted to join contiguous proposed states-and to ask Congress to approve the creation of these six new states. One big legal question this measure raises is whether the people of a state can validly cede territory for the creation of a new state through a popular initiative. This question actually has multiple parts. Article IV, Section 3, of the federal Constitution requires, for the creation of new states, the "Consent of the Legislatures of the States concerned," so one issue would be whether the California electorate can act directly as a "legislature" for these purposes, or instead whether the elected folks in Sacramento have to sign on, to satisfy the U.S. Constitution. But today I dwell not on the federal constitutional aspects (to which I hope to return in later columns), but instead on California state law, and the distinction California draws between "revisions" of the state constitution and "amendments" to it. An "amendment" can be put on the ballot for voter approval if two-thirds of each house of the legislature votes to place it on the ballot or if enough voter signatures are gathered to qualify the measure (as Six Californias backers are trying to do). A "revision," by contrast, can appear on the ballot for voter consideration only if two-thirds of the houses of the legislature vote to place it, or if a legislatively proposed state constitutional convention decides to place it on the ballot. (Until a change in the state constitution in 1962, only constitutional conventions could propose revisions.) Thus, under current law, revisions must go through a process that starts in and runs through the legislature, whereas amendments can bypass the legislature altogether and rely on signature gathering. The key and difficult question, of course, is what differentiates "amendments" from "revisions." The California constitutional text itself offers few clues, but the California Supreme Court-in rulings that span many decades-has told us that to determine whether something is a revision, we must look "quantitatively" (that is, to the number of existing constitutional provisions a proposed change affects or the number of words the proposed change involves) and "qualitatively" to see if the proposed measure "substantially change[s] our preexisting government framework," makes "a fundamental change in our preexisting governmental plan," or "involves a change in [the] fundamental structure . . . [of] California government." The court has, in more than one case, given a standard hypothetical example of such a change: a measure that would "vest all judicial power in the Legislature." Such an alteration in the respective powers of the judicial and legislative branches, says the court, would profoundly change the "scheme" of government so as to be a revision. In Raven v. Deukmejian, a 1990 case and the most recent ruling by the court holding a measure to be a revision, the Justices considered an initiative that directed the courts of California to construe a set of state constitutional rights of criminal defendants to afford no more protection than that provided for by the United States Constitution. The California court found that this provision wrested power from the California Supreme Court to give independent meaning to a host of state constitutional liberties and provisions. In so doing, the Justices reasoned, the initiative told the California court how to do its job and made the California jurists simply puppets of the U.S. Supreme Court's Justices, who have the final say in determining the meaning of the federal Constitution: "[The measure] in practical effect, vests a critical portion of state judicial power in the United States Supreme Court, [which constitutes] a fundamental change in our preexisting plan of government." In Raven, the court distinguished earlier cases in which it had rejected claims that initiative measures were revisions rather than amendments-including a case involving a measure that directed state courts to construe the state constitutional ban on "cruel and unusual punishments" to be no broader than the federal Eighth Amendment's prohibition. Those earlier cases, the court said, involved "isolated provisions," did not concern "far reaching, fundamental changes in our governmental plan," and did not amount to "a broad attack on state court authority to exercise independent judgment in construing a wide spectrum of important rights under the state Constitution." How Would/Should Six Californias Fare Under the Revision/Amendment Formula? On which side of the line should (would) the Draper proposal fall? While I am disinclined to make predictions, I think there is a forceful argument that dividing up the state into six new states ought to be considered a "change in [the] fundamental structure . . . [of] California government." For starters, when the Raven court's Justices (and earlier decisions) talk about "revisions," they almost always do so in terms of changes to the "plan," "scheme," or "structure" of government. "Plans," "schemes," and "structures," in constitutional law, are generally terms of art that refer to the division of authority between, and the relationship among, different government entities. These "structural" provisions and themes are often distinguished from the "rights" aspects of a constitution, which concern the relationship between all institutions of government, on the one hand, and private individuals (or groups of individuals), on the other. Dividing up a state certainly could affect individual rights, but such a division is first and foremost a matter of structure: structure is literally all about the edifice, about how something is put together, about constituent parts and elements, and how they do-or don't-fit together to form a whole. And as to whether dividing up a state into six pieces is a major, pervasive change in (rather than an isolated alteration to) its essential structure, we might ask: What is of greater importance to a state than its geographic boundaries? As recent events in the Ukraine (and elsewhere) remind us, legitimate regulatory authority over people who reside in particular physical territories is largely how we define government. It is much of what we mean when we talk about the sovereignty of a nation or state. Tweaks in a state's boundaries (say, to assimilate former federal enclaves) may not implicate basic structure, but division of a whole state that has existed in its current form for a century-and-a-half into six separate new ones would be hard to characterize as anything but fundamental. Why, then, am I reluctant to predict with confidence that Six Californias, if challenged, would be struck down? (For these purposes I do not distinguish between a pre-election attack and a lawsuit filed shortly after the measure's adoption, although state courts may be more receptive to a challenge before the voters speak.) The first reason is that the revision/amendment test the court has cobbled together is itself open to a great deal of criticism, and thus might evolve further in subsequent cases. Why, for example, should we engage in a "quantitative" assessment at all? For example, if a state constitution, when written in the 1700s or the 1800s used "he" and "his" pervasively, and later on we wanted to alter it to say "he or she" and "his or her," should we conclude that this updating involves a fundamental change in the plan of government simply because of the number of words and provisions involved in the proposal? To be sure, there may be a correlation between the number of provisions affected and the basic importance of the proffered change, but we need not rely on such a correlation when we can examine the qualitative nature and scope of the change directly. Moreover, and perhaps more basically, having to run all "fundamental structural changes" through the legislature may be a dubious notion after states like California adopted the initiative device in the early 1900s. Requiring the state legislature to approve (or convene a state constitutional convention to approve) measures that are themselves designed to check the legislature-and circumventing legislative inertia or self-dealing was precisely why direct democracy devices like the initiative came into being in the first place-seems odd. (Legislative) foxes simply ought not to be allowed to guard (reform) henhouses. Moving beyond the test the courts have articulated to distinguish revisions from amendments, and focusing instead on the results the judiciary has reached, we see more reasons to be cautious about predicting judicial invalidation of Six Californias. Raven is the only case in many decades to hold that a measure is a revision because it fundamentally changes government structure, and that case involved the court protecting its own powers. Indeed, notice that the specific things the court has in recent times said must go through the revision process-the hypothetical shift in power from state courts to the state legislature or (as in Raven) an actual shift from the California Justices to the United States Supreme Court-involve diminutions of judicial power in particular. Other significant changes to California government operations-the creation of the initiative device itself, the adoption of limits on legislative terms, massive changes in state and local tax power and tax revenue distribution, and the 1962 change that allowed the legislature to propose revisions without the need for a constitutional convention-have all been allowed to come about via amendments to the state constitution rather than revisions of it. And in at least a few of these instances the California Supreme Court explicitly rejected the claim that revision procedures should have been followed. So while my sense is that Six Californias should be considered a revision (to the extent that the California courts continue to follow the test they have laid out), there is some chance that the measure, if challenged, would survive this attack. Six Californias proponents might try to argue their measure is not a revision because it does not actually change the state structure, but merely begins a process that could lead to a six-way split. To be sure, the precise lines between the six new states can undergo some tweaks, and congressional approval would be required before any new states were actually created. But the Draper measure does, by its own terms, assert that the measure, if enacted, would constitute the legislative consent by California that the federal Constitution requires for creating new states. That there needs to be another event (congressional approval) that takes place before the split goes into effect does not, to my mind, diminish the important change this measure brings about. Imagine, for example, that no congressional approval were required under the federal Constitution (and that only state approval were needed) but that the Six Californias measure, by its terms, made the proposed split contingent on California reaching the 40-million-resident mark. This condition subsequent (a condition that must occur before the old California borders are to be undone) would not diminish the fundamental change occasioned by enactment of the hypothetical measure. So too with the need for congressional approval. Perhaps one could argue that my hypothetical is distinguishable because congressional approval is not just a condition subsequent like a population trigger, but is also a requirement for a deliberative process that is a safeguard against ill-advised break-ups of states. But I don't see how a national approval process could be a substitute for the more involved intra-California process through which revisions are supposed to go (as compared to signature-driven amendments). If there are valid reasons (and California law supposes that there are) for having a distinction between revisions and amendments within California (e.g., a more careful vetting process in the legislature), these reasons do not disappear by virtue of federal approval. Indeed, to the extent the California Supreme Court has ever talked about conditions subsequent in initiative amendments, its discussion hurts, rather than helps, Six Californias. In 1894, in Livermore v. Waite, the court addressed a challenge to a proposed measure to be submitted to the voters that would have moved the state capital from Sacramento to San Jose, but only if San Jose gave up some land and some money to facilitate the move. The court first rejected the notion that the measure had, as was required of all revisions at that time, to be generated by a constitutional convention, saying the measure wasn't fundamental enough to be considered a revision, but not relying at all on the condition subsequent as a basis for rejecting the revision challenge. But then the court said that, as a constitutional amendment proposal, the measure was unlawful and could not be submitted to the voters because its effect was conditional on San Jose's subsequent actions. If this reasoning were followed (and I hope it wouldn't be, because this part of Livermore makes little sense-why can't an amendment take effect only upon certain conditions? ), then the Six Californias proposal would be blocked on that basis, and the only way California could consent to creating a new state would be through an act of the legislature (which is what the Livermore court said could be done if California wanted to move its capital). A final argument supporters of Six Californias might make is that the proposal doesn't really alter the California constitution at all, and thus can't be a revision of it. The notion here would be that (notwithstanding that Six Californias mentions tweaking Article III of the California constitution), the California legislature already has the power to pass a simple statute to consent to divide up the State, so that Six Californias is not changing the state constitution-it is merely exercising ordinary legislative power. On this view, Six Californias is thus best thought of not as a constitutional amendment initiative or a revision, but rather as a statutory initiative. This argument has problems, though. For example, it is not clear to me that the California legislature is given the free-wheeling power by the California constitution to pass an ordinary statute approving a break-up. The California constitution does vaguely refer to California's boundaries having been "modified pursuant to statute" since 1849, but without more study of those statutes we cannot necessarily conclude the legislature is authorized by California law to pass simple statutes dissolving the entire State. Of course, Article IV of the federal Constitution-which, by virtue of federal supremacy becomes the law of every state-arguably gives each state legislature the power to pass statutes approving the creation of new states within its borders (subject to federal approval), but this invocation of federal law doesn't directly confront the question whether California law contemplates that the people, acting directly and without going through vetting in the legislature, are permitted to exercise a power that radically alters the State plan, even if the legislature would (by virtue of Article IV) have statutory authority. That is the question posed modernly by the revision/amendment distinction, and I am not sure that question can be easily avoided by characterizing Six Californias as statutory. But I readily acknowledge that these are tricky matters. In later columns, I will (assuming Six Californias remains relevant) explore other legal claims raised by the proposal. Last Friday, Professors Jack Chin and Rose Villazor organized a day-long roundtable discussion at UC Davis School of Law of chapters of their forthcoming book, "Legislating a New America," on the 50th Anniversary of the Immigration Act of 1965. The book is under contract with Cambridge University Press and scheduled for release in 2015. The Immigration Act, which came on the heels of the Civil Rights Act of 1964, represented a monumental change to U.S. immigration law and, among other reforms, eliminated a discriminatory quotas system. I must say that I was energized by the provocative and innovative quality of all the papers. The book project will be extremely interesting reading. The UC Davis Department of Theatre and Dance will host The Grapes of Wrath Symposium on Friday, March 7, to explore John Steinbeck's work directly as well as the larger social, cultural and historical issues it raises, while celebrating this 75th anniversary year since the publication of the epic novel. The symposium, open to the public and free-of-charge, will be held in Lab A at Wright Hall from 10:30 a.m. to 5:45 p.m. Participating UC Davis scholars include Sasha Abramsky, author of "The American Way of Poverty: How the Other Half Still Lives" (one of the New York Times 100 Most Notable Books of 2013), who is a freelance journalist and part-time lecturer in the University Writing Program and research affiliate with the Center for Poverty Research. Abramsky discusses contemporary poverty and the new Dust Bowl of Texas and New Mexico, the dislocation that water shortage causes, and how policies post-1930s have limited agricultural calamity. Marianne Page, professor of economics and deputy director of the Center for Poverty Research, joins Abramsky to discuss how poverty policies deal (or don't) with issues specific to rural areas. Professor Eric Rauchway, history department, is discussing the Great Depression as a background context. Matthew Stratton, assistant professor of English, will be talking about changes between the play and the novel, and W. Scott McLean, lecturer in comparative literature, examines how some of Steinbeck's issues influenced later song writers. Professors Philip Martin, chair, UC Comparative Immigration and Integration Program, and Lisa Pruitt (School of Law) will discuss rural poverty in Oklahoma/Dust Bowl and in the Central Valley, then and now, including efforts to prevent indigents from entering the state in the 1930s. They will also touch on the similar (and different) stresses of rural poverty in the 21st century. Kathy Olmsted, professor of history, talks about labor politics in the 1930s in relation to Steinbeck. The symposium, open to the public and free-of-charge, will be held in Lab A at Wright Hall from 10:30 a.m. to 5:45 p.m. A complete agenda is available at theatredance.ucdavis.edu. 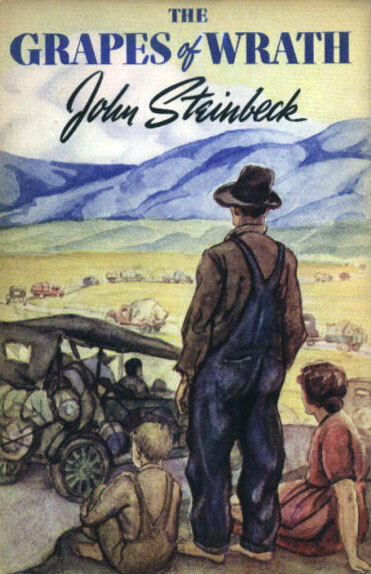 What: The Grapes of Wrath Symposium featuring UC Davis scholars explores Steinbeck's work directly as well as the larger social, cultural and historical issues it raises. When: Friday, March 7, 10:30 a.m.-12 noon. ; 1:30 p.m.-5:45 p.m.